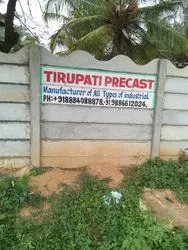 Since 2015, Tirupati Precast is working as a trustworthy Manufacturer, Service Provider of Industrial Walls. The range we offer includes Compound Wall, Prefabricated Structure and Footpath Curbing. Our products are offered to the clients after properly cutting, finishing and making sure their abidance with industry laid norms. Moreover, we offer free customization, on-order product design and turn-key project handling so as to meet distinguished demands of the clients. Fine finishing, longer life, dimensional accuracy and competitive prices make our products widely demanded by the patrons. Moreover, our ability to fulfill emergent of bulk orders within the specified time has enabled us to serve huge clientele. In order to ascertain our place in the long run of market competition, we have state of art infrastructure installed with latest machines and segmented into different units for hassle-free functioning. Furthermore, we recruited a team of talented staff members, who not only posses immense skill but also have got real time experience of the respective industry. Our products are crafted in accordance with international standards, and thoroughly tested by our skilled quality supervisors to ensure perfection. Owing to all these strengths, prompt and committed delivery system, we have become a preferred name among clients in a short span of time. 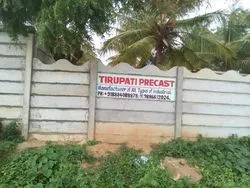 We, Tirupati Precast has come with the concept of 21st century of RCC Pre-Cast techniques guaranteed consumers in india safe, cheaper, re-usable RCC Compound Wall. Having all the state of the art production facilities, we are capable of providing customization facility as per client’s requirement. Our production unit is empowered with world class machines and skilled workforce to maintain efficiency in all the business operations. Our infrastructure is divided into various units namely designing, production, sales and marketing, warehousing and packaging, research and development, logistics, quality control, administrative. Apart from this, we have a widespread warehousing unit that has huge capacity to store our entire products safely. At a regular time interval, we upgrade our facilities that ensure smooth production process. We constitute the experienced and expert workforce that always works hard to provide the cost-effective and best-in-the-quality product line to our clients. All of our employees are very dedicated, workaholic and perform their duties with expertise and sincerity all the time to come up with excellent products. 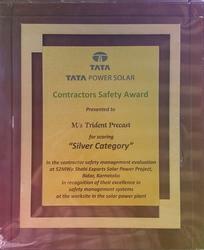 Our manpower includes more competent professionals in the market as compared to the others. Within short span, we have earned an enviable reputation among our clients for our quality products. We never compromise on our responsibility and accountability and always try to leverage our skill for fabricating the products in consideration with attaining higher rate of client satisfaction and catering to the demand of effective support. There is no denying the fact that we are the preferred choice by many of our clients. With quality, quantity, time and services our mission is to compound India with RCC Pre-Cast wall.